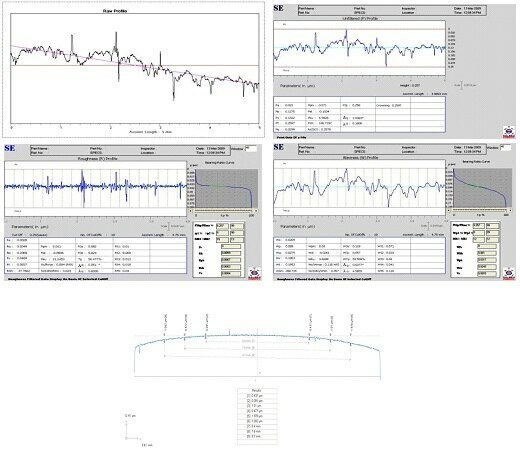 •	SeSurf User Interface to Control, Measure and Position •	Raw Profile ( Best Fit Line, Curve, Slope Remove) •	Unfiltered profile Analysis (24 parameters) •	Roughness profile Analysis (24 parameters) •	Waviness profile Analysis (24 parameters) •	Three Filter Modes: Gaussian, 2CR & 2CR PC •	Bearing Ratio Curve Parameters •	Crowning (Camber Measurements) •	Multi Data Plot •	Specials programs for Analysis can also be developed SeSurf computer Interface/ Retrofit is a laboratory standard with ruggedness and easy to use. The Software is User friendly and Powerful. SeSurf allows the user to make measurements, analyze them and even re- analyze them to any other conditions and parameters at any later date in the future, thus decreasing Time and improving Productivity Effective surface characterization requires accurate acquisition of data, coupled with appropriate analysis. Traditional measurement methods have reported only surface roughness, providing an incomplete picture of the surface texture, which comprises a matrix of complex, interrelated characteristics. SeSurf incorporates the best industry Standards for data analysis. Data acquired from the instrument is represented graphically in Raw, Unfiltered, Roughness and Waviness modes. Raw data acquired can be analyzed for Slope Removal, Best Fit Line and Best Fit Arc which ever suits the form of the job. There is also a provision for the user to omit areas, unwanted for further analysis. Unfiltered profiles can be analyzed for Roughness, Waviness with cutoff wave lengths of 0.08 mm, 0.25 mm, 0.8 mm, 2.5 mm, 8 mm in 3 digital filters wiz: Guassian, 2CR and 2CR PC (Phase Corrected). SeSurf also provides an option for data to be analyzed with a combination of both Roughness and Waviness. SeSurf provides 14 parameters for Unfiltered Profiles and 24 for Roughness and Waviness parameters. It also enables the user to perform Statistical analysis on measured results. SeSurf’s Bearing Ratio curve enables the user to asses contact/area at a given depth from profile height in percentage to the assessment length. Parameters assessed are Tp1, Tp2, Htp, Rmr, Rk, Rpk, Rvk, HSC and Pc. SeSurf Machine Retrofit comes with 12 months free warranty.